Solgar Choline 250 mg / Inositol 250 mg Vegetable Capsules contains both Choline and Inositol (commonly known at Vitamin B8), with both playing an important role in several different processes in the body. 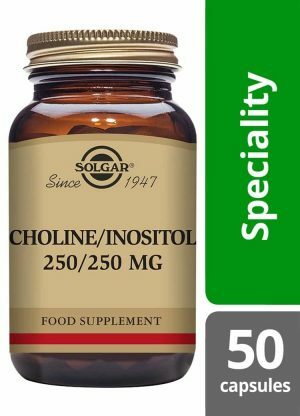 Inositol, also known as Vitamin B8, is a water-soluble structure and it forms a component of every cell membrane in the body. It functions in a similar way to choline. Inositol, although technically not an essential B vitamin because it can be synthesised in the body, is still a very important nutrient. Food which naturally contain Inositol are citrus fruits, lecithin oil, seeds, whole grains, nuts and green leafy vegetables.